Contactless teleticketing systems, based upon the Calypso standard, the DESFire technology or on other systems, enable the owner of a contactless object with proper rights (transport contracts) to enter and travel in transit networks. These rights must have been previously acquired. Ticketing contracts are secured inside contactless cards and tickets by the use of cryptographic keys required for any operation. However, in any technical system, several technological frauds are theoretically possible when the cards are processed: personalization, sales and validation. Transit operators therefore use monitoring systems to detect and analyse technological frauds, in case they would occur. Spirtech designed and markets the Fraud Detector. Installed in the central ticketing systems, it processes all the reports received for the operations done throughout the system. It monitors the use of contactless cards and tickets in order to report and alert any suspected fraud. It allows the system manager to assess the risk and to react accordingly, for example by putting a card in a black list. The system allows to get rid of, or limit, any risk of fraud. 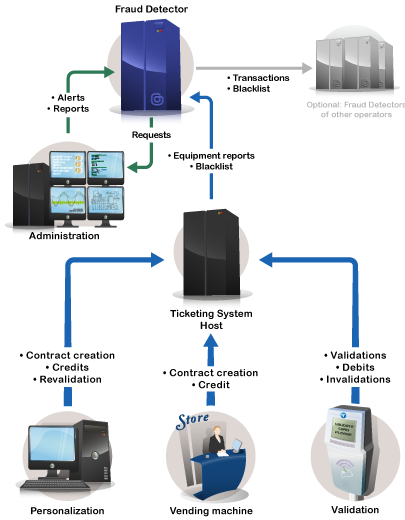 The Fraud Detector interacts with all the teleticketing system by being indirectly connected to validators, personalization terminals and vending machines which transmit detailed information about all operations done. 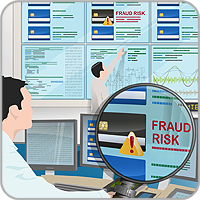 The Fraud Detector manages a database of all the cards and tickets temporarily associated with their last transactions. In order to protect the privacy of the customers, it never associates a card with a person and it erases all transaction data after a short period of time. Supplies reports for the accounting department to allow comparisons with the accounting information supplied by the contract issuers. Carries out the coherence controls between the data received from the contract issuers and from the validators. Produces statistics reports for possible coherence verification with manual controls on the field.